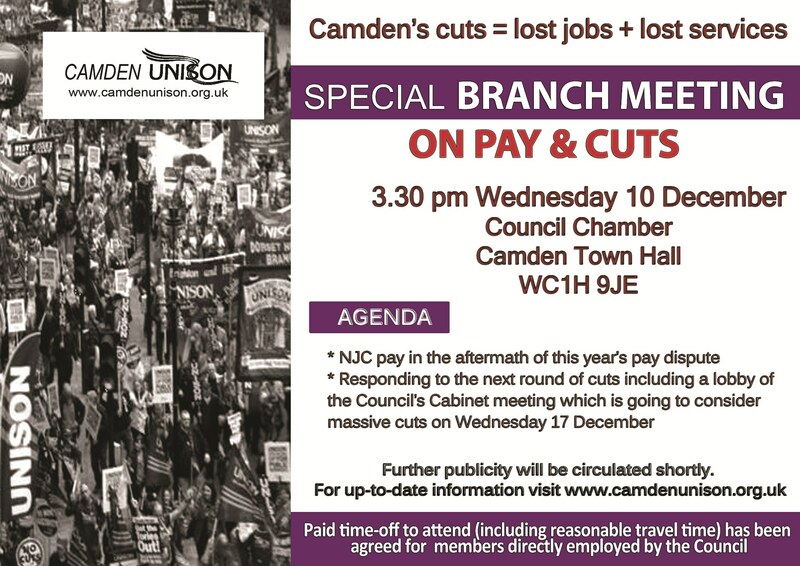 There will be a special branch meeting at 3.30pm on Wednesday 10 December in the Council Chamber, Town Hall (1st Floor), Judd Street, WC1H 9JE. Time off has been agreed for Council employees. Updates on the agenda will be carried on this website closer to the time. Members with specific access requirements should contact paul.england@camden.gov.uk ASAP, so that arrangements can be made to enable them to fully participate in the meeting. Please encourage your union colleagues to come to the meeting with you. Non-union members can join today and attend. You can also print and display a poster advertising the meeting, by clicking on the image, above.